Some kids are too smart for their own good...and maybe for everybody else's good. The overly ambitious little girl from Oh No! is back for more. But this time, she doesn't have a humongous problem, she has an EPIC crisis on her hands: a mere A on her history test! There's only one solution: travel back in time to 33,000 B.C. to make her wrong answer right! 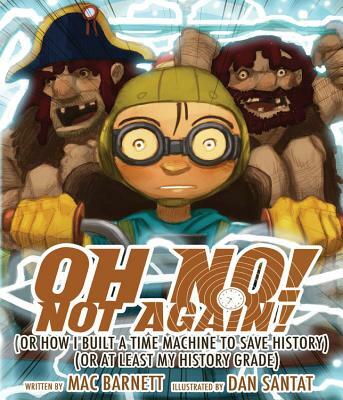 Mac Barnett and Dan Santat's laugh-out-loud sequel to the critically acclaimed Oh No! will be sure to tickle a prehistoric funny bone for fans new and neanderthal alike. Mac Barnett (http://macbarnett.com) is a writer living in Oakland, CA. He's also on the board of 826LA, a nonprofit writing and tutoring center, and founder of the Echo Park Time Travel Mart, a convenience store for time travelers (seriously). Billy Twitters and His Blue Whale Problem, his first picture book, was published by Disney*Hyperion Books in June 2009. Dan Santat (www.dantat.com) is the author and illustrator of Guild of Geniuses and the illustrator of many books, including the Otto Undercover series by Rhea Perlman and The Secret Life of Walter Kitty by Barbara Jean Hicks. He also has an animated series for Disney called The Replacements. His first book with Hyperion, Always Lots of Heinies at the Zoo, published in May 2009. He lives in Southern California.